This is amazing. I love the different shades of blue. And his horseshoe ring to compliment. love all of the blue. i love that ring! he got style. I love the hat too! His facial expression is priceless, love it! Such a good photograph! Cool shot! I love the character in his face. Love the jeans, love the attitude. I can’t say I love the shirt though, sorry! I noticed the ring too! Love it. The ring he wears is not a horseshoe but a lyre, an ancient music instrument. Probably he is a musicien. I like the blues, even his watch is blue. I’m waiting for the anti-smoking brigade. Come on guys, another chance to get hysterical!! Very nice. Actually the watch is a black faced IWC 5001, which is very cool. I also like the LVC jeans. What a countenance. To me, his facial expression, plus his tubble and cigarette, are also integral to his look. It was definitely the first thing that I noticed. 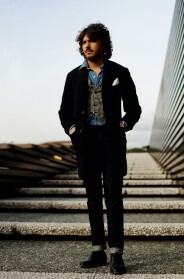 His cragginess adds contrast and masculinity to the buttoned-up denim. Gorgeous Levi’s with hickory shirt – I am such a big fan of denim on denim! Fantastic accessories to go with as well. The denim on denim look is awesome, vey cool =) Amazing photo! Ok Remy I will take the bait. Not to be hysterical but there have been a lot of smoking shots lately. It just seems sooooooo dated to me. Back to the subject at hand. I am not supposed to wear jeans to work so I revolt by wearing layers of denim. It is fun to pair a few shades and textures together. Denim rocks!!! I wonder if what he’s holding might be an invitation. I am really into the denim. I’d love to know what he’s looking at! I like blue jeans and the ring! Ur work is very Artful! Nice 2 now that there r more people like me in this world! Interesting how the relatively small difference in blues keep things from looking like a uniform. Nice. Love this guy! Simple and chic and the ring is a fabulous little touch! Thanks Remy for identifying it as a lyre, that makes this guy even cooler! expression is killer. i ll never tire of the J Dean lighting fag look ;) would defo look twice for him! love the blue and blue and blue factor. cool.un pretentious. If there have been a lot of smoking shots lately it’s because people smoke! It is as simple as that! And the picture is interesting because of the cigarette. This guy will probably have another expression (less particular) without the cigarette. ¿Fumar está o no está pasado de moda? I find that there is something really interesting in a man who can manage to wear blue denim, maybe is the whole workers thing, maybe it reminds me of cowboys, maybe it has to do with the fact that right now I am really into blue denim, the fact is I like this. The best detail defenetely, his ring!!! Blue is always perfect… and denim is cool everywhere!!!! This photo is expressive and the guy looks like a movie character! What a great hat.. very classic. I love the mini pinstripes in his shirt which works fantastic paired with the jeans. The IWC watch is sooo cool. The man has got it going on. Blue is a beautiful colour … always worth investing in. I love the simplicity of his whole look. His casual pose adds to the mystery. I really like this shot. Definitely noticed the Levi’s from the back pocket stitching. Nice style – one point for Asian men! This pic has inspired me to wear my IWC Port 5001 in a more casual manner. Great pic as always! I love outfits loaded with historical reference. Here the hat and blue on blue are like a hipster take on the Mao Suit. i’ve noticed that a great deal of the subjects are holding cigarettes. just wondering if anyone else has noticed this. it must be due to the fact that all photography is out on the streets, and the subjects are out taking their smoke break. Great look … BUT … smoking is never cool and should never EVER be glamourized! very NOT COOL!